You Think You’re Ready, But…. Reality kicks you in the teeth. Woke up around 4:30 am which gave me plenty of time to write up the post for the previous day. I can’t remember what time I finally got moving. I guess it was likely around 9 am. Maybe 8. My original plan had been to hit the ground running as soon as it was daylight enough. I rethought that plan, deciding it would be best if the daylight was strong enough for the camera to have a decent shutter speed. My tripod is sitting at the apartment back in Sweden after all. Finally got everything together which took several trips on the steep walk to and from the vacation apartment to the car. 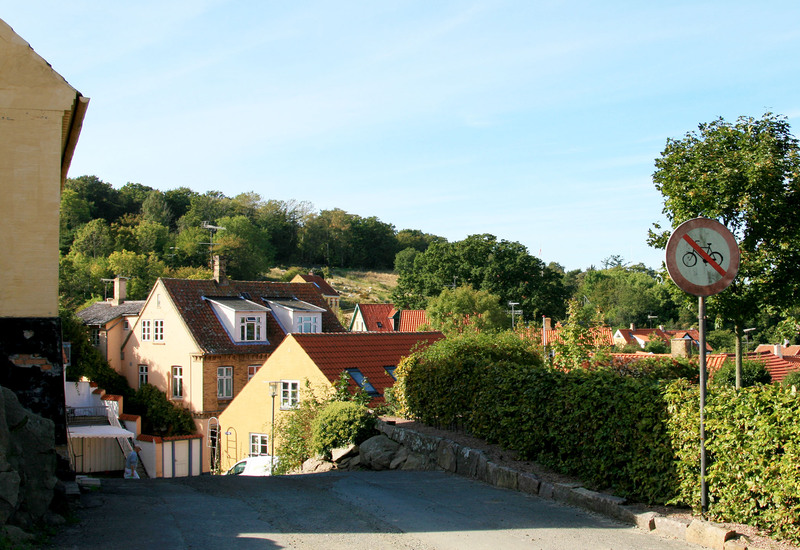 DR #401 – Brogård Runestone. Taken while driving to apartment. Loke was raring to go. Oddly, I felt more… annoyed than anything. I have no idea why. The start of our outing was a gentle coast down the slope toward the center of Allinge. It’s a pretty sort of harbor town. Some old buildings tightly clustered around narrow, twisting and often steep little streets. Quite impressive to watch buses wind their way through some of them. We weren’t going down to the old center though. A sign for rock carvings guided us into the first turn which turned out to be up a very nasty hill. Then there were no more signs. I made a turn onto a what looked like a drive way, but map and GPS insisted it was a cycle path. It was, but not the one I needed. So, back I went. I coasted back down to the main road to head north. Then I stopped to look at my maps again. It gave me a moment to reorient myself and I decided what I needed to do was go back to follow the sign again and continue climbing the hill. Poor Loke was so confused with all the back and forth. It only served to continue souring my mood as did the more than 5 minute slow crank up the hill which had to be a grade of more than 13%. Cresting that hill, I made the turn toward a football field. The chugging of a tractor explained the scent of fresh cut grass on the cool morning air that was delightfully still. The turn also rewarded a view of another of the signs for the rock carvings. I turned onto a gravel drive where I could finally see the tractor clipping grass on one of the football fields. There were information signs for the rock carvings too. I sat in the trike seat and stared off into the distant hill where a well beaten path led. Abruptly, I decided that if the hills were as steep as the one I’d climbed, I didn’t want to expend the energy on a quarter mile hike across a field. At the last blue and white guiding signs, the little road became a cycle path. A paved, delightfully, wonderfully FLAT cycle path. Clearly it was once part of Bornholm’s rail system which no longer exists. My theory is that trains were used early in the history of mechanized travel. That period where trains were predominant, but cars had yet to be improved and commonly used. With the rise of vehicles which didn’t need tracks, particularly the larger lorries and buses which were far more flexible, the trains were no longer needed for such a small land mass. That’s my theory any way as there is not a single working rail line on the island today. More carvings at 2nd location, some I’ve never seen before. Loke tried his best to run on that flat pavement. Rather quickly I brought us to a stop at another set of information signs. Beyond them, less than 50-60 yards away was dome of smooth, glacial scrubbed rock. I pulled the trike off the path, leaving Loke with it before I started toward the rock. It was indeed covered in rock carvings. Dozens and dozens of cup marks the size of 50 cent pieces, ships, foot marks complete with toes which isn’t very common, and some kind of odd curling design that looked almost like a question mark. It was a bit tricky getting up to them on the height of the dome as I stubbornly hadn’t taken the time to change to proper shoes and walking on sloping rock is tricky at best in cycle shoes. Location 3 Rock Carvings – Loke & Trike in background. Off we went like a shot, Loke again pulling like a crazed 4 year old husky instead of the 9 year old he is. Just a little further on, we stopped again for yet more rock carvings. I really should have changed to my sneakers. It might have even been less time over all if I’d done so. This slab of rock took a little more careful climbing and meandering to get a good position for photos. This time I used Jens’ little point-n-click as it was easier to get good angles from a little closer in than with the new Canon lens. We passed a few people as we zoomed along the short stretch of the cycle path. It abruptly changed to gravel and a barrier ahead to keep cars away had just enough room to squeeze Loke and the trike by. A pair of women on bikes were just on the other side of the barrier as I went around it. The younger one called out something in Danish. I answered with an apology in Swedish. She tried English and I said yes. She wanted to know if the path was good for bikes and would it take them to Allinge. I told them the path was meant for bikes, part of the old train system and it would go to the town though it would end south of the center. She thanked me and off we all went. I was a bit uneasy with the next roads we took. Very steep descents that took us to a small village. The knowledge of what I went down, I might very well have to grind back up was foremost in my thoughts. Still, somewhere north of us lay an old church ruin. We zig-zagged back and forth as I sought a path to the ruin thankfully managing to avoid the hideous climb we’d plunged down. It sat further north, just a little west of the very tip of the island. All the trails I found were for hikers, far too narrow for the trike alone let alone trike and husky. I turned toward the lake which was lovely. Clear, rippling water with a wonderfully level path beside it free of traffic. On the other side, rocky cliffs jutted. Some of the faces of rock were sheer. The stone was beautifully lit by the early sun. I took quite a few pictures of those cliffs as I enjoyed the lake view. Somewhere along there, my stomach announced it was not happy. That added to the overall sense of annoyance, heightening it to aggravation. Yet another brutal hill, I called Jens to check in as I crept up at less than 1 mph. By this time I’d barely 3 miles under the tires and over 2 hours on the trike. Not for lack of Loke trying to help. Bless his fuzzy heart. I don’t think he ever let the tether slack. Even on the two all-too-brief flat bits, he pulled like mad wanting more than the trot I allow him. Jens offered to meet us at the castle ruin to explore it together. He also suggested that since I had days more rides planned maybe I could call this day short and we could use it for sightseeing. When the castle ruin came into sight, I didn’t get an answer when I called to let Jens know. I was rolling down the path for the climb up when he called me back. We decided that by the time he got there, it would have meant me waiting too long or that maybe I’d even be ready to leave. Though there were clear signs pointing to cycle parking, I hadn’t seen any signs actually forbidding bikes on the path up to Hammarshus ruin. Off we went. There was actually a lot of work happening at the site. Little truck like vehicles bumped over the tumbled cobbles and eroded ruts while carefully winding around the many pedestrians or me and Loke. I expected it to be hard which helped make the effort bearable. Loke helped as much as he could, but there were still sections that the tires slipped on cobbles or loose gravel. One stretch, something unexpected happened which added to the frustration I’d already been struggling with. I couldn’t go forward, so attempted reversing in hopes I could sort of zig-zag my way up. Something went wrong with the rear cassette as the chain jumped. The slope was so steep that my parking gear couldn’t even hold me very solid, but somehow, I managed to lever myself out of the trike at that steep angle. I sat down in the dust and gravel, beyond aggravated and just so tired of every inch of the ride requiring herculean effort. I’d thought myself ready, but it was proving too much. After peering around, I found the problem. Part of my chain tube had broken loose. Going forward, the chain pushed it out of the way. When I tried to back up, the chain carried the rubber back into the rear cassette, making it jump off the teeth where tension yanked it down to the smaller rings. I needed either a sharp knife or strong scissors to cut it away or duck tape to pin it in place. I lacked any of those things. This meant I couldn’t let the trike roll backwards for anything. If I had to turn around in a narrow area, there would be no way for me to do the multipoint turn by going back and forth. I would have get up, lift the heavy back end of the trike and physically walk it around. My back was going to hate me. My back was going to hate me even without that annoyance. There were sections of the path that defeated the trike. So steep that the tire simply spun. Sometimes, it would even roll back a couple inches even as it turned forward. For about a 50 yard stretch, I marched up the hill, shoving the trike along before me as Loke dragged. When it levelled a bit, I got an astounding view off to the north. There was a haze in the air, but it did little to diminish the scenery. I had to take pictures of course. The ruins were more extensive than they first appeared. It seemed to be 3 broken bits of larger buildings with some walls, tumbled wrecks of 2 or 3 drum towers. Some had scaffolding where workmen crawled around, busy with restoration work. Inside the biggest ruined building, an old doorway or arch opened out into another whole section beyond. It might have been either a second smaller courtyard or a vast open hall with smaller rooms opening to either side. After exploring around with my crazed husky, I went back to the trike to look at maps. I knew the way from the castle was more hard climbs and there wasn’t really much to see. Most of the rest I was interested in was further south and east. Honestly, I was exhausted and utterly disheartened. Disgusted even with hours I’d spent for a measly 4 miles. Sitting by the path as I moped over the maps, Loke and the trike started to get a lot of attention. People came up to pet him. One woman took photos of him with her iPad, urging me to get in with him. One older man, slowed and looked at the trike. I was about 10 feet away to sit on a rock. He glanced at me and asked in Danish if it was my bike. ‘Ja’, I replied. Didn’t notice the pond earlier! ‘Svenske?’ (Swedish) he said, surprised. I replied in Swedish that I lived there, but was American. He grinned and swapped to English, asking what part of the US. I went with Mobile, Alabama as it’s the closest large city to the last place I lived in the states. He laughed, ‘I know Alabama. Drove there on the way to New Orleans’. Then he told me how about 20 years ago, he’d landed in New York and he and his wife drove to D.C. And then New Orleans, Chicago and finished their trip in Minnesota. I must have looked as exhausted as I felt because he gave me a friendly pat on the shoulder and wished me a good trip. Still he came and we found somewhere to eat in Allinge after I’d come to the apartment to clean up and change clothes. Then we went driving to look for a fishing spot for Jens. Pretty scenery. We also stopped in Gudhjem (Home of God) to chase down a church and a ruin. Not sure I could get there with bike. Many of the streets are banned to bikes, being far too steep. Oh! The ruin was also a first for me. The first church ruin I’ve come across where the church was blown up. I blinked at that. Hehe. Cycling is forbidden on many streets in Gudhjem. Once he found a few likely places, we took off across the center of the island to head to Rønne, the largest town, for groceries. We found another castle ruin on the way, stopping to look at it. Heavens, my legs were weak as wet paper for making the climb up. Jens was laughing at me as I wobbled, stopping a couple times to slap at my legs to get the ache out of them so I could force another step. Also on that drive, I discovered the interior of the island, with a few exceptions, is significantly flatter.